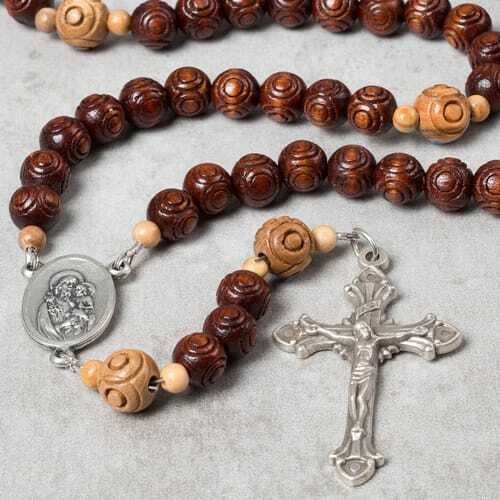 Various shades of etched wooden beads give this rosary a tone that speaks instinctively of St. Joseph. Modest yet intricate, they bring to mind the hardworking man who was both a simple carpenter and the privileged foster father of Jesus. A thoughtful gift for any boy or man who wishes to grow in devotion to St. Joseph and Our Lady. Accompanied by a prayer card featuring the 20 mysteries of the rosary and which days to pray them. This is a very beautiful rosary. I purchased it for my husband and he likes it very much. Good quality, nice feel in the hands. This beautiful hand-carved Rosary is very well made with detailed carved beads. Our adult Son loves it! I really like my rosary!! This is my first rosary and I will cherish it the rest of my life. Excellent quality!!! Worth the cost for this beautiful rosary. Hand made beads are awesome!